The coffee mug in the banner along the top of this blog was once my favorite mug. I retired it a few years ago, but it was a clear glass NASA mug that had the United States Seal embossed on the bottom with the NASA logo in gold leaf on the side. You can just make out “America” from the embossed “United States of America” that ran around the bottom. The mug that replaced that one is my frog mug, picked up at the Dallas World Aquarium. I blogged about it here. And I retired it today. I’ll keep it, and drink coffee from it occasionally. But it’ll spend the rest of its days sitting side-by-side with its clear glass predecessor from NASA. My new favorite mug is also from NASA and it’s pictured below. One side reads “It’s only Rocket Science” followed by a line-by-line explanation that accurately describes the twelve lines of rocket science on the opposite side. I don’t pretend to understand it. 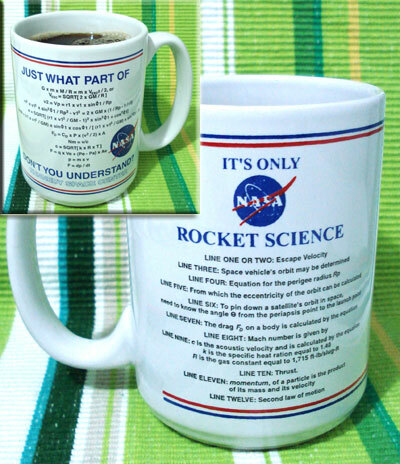 But if I can’t think like a rocket scientist, I’ll at least be able to drink coffee like one! Is that the perfect geek gift or what? do you still have this mug? would you be interested in selling it? Sadly, I do not. It broke a few years ago.